I’m reminding all of you that DineLA Restaurant week is about to arrive! October 2-7 & 9-14, 2011. 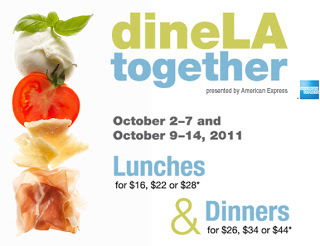 You get great deals on all the best restaurants around Los Angeles. All three course meals for lunch and dinner. To check out the extensive list of participating restaurants, menu’s and to make reservations, the link is posted below. I know I will be hitting up a bunch and blogging about it! Hope you do too! Bon Appetit!! !